The Bill Munday School of Business has incorporated a model of business education that seeks to integrate all of the core school functions with the Austin business ecosystem and works to drive its mission to the marketplace. The Bill Munday School of Business delivers an experiential, values-based education in the liberal arts and the Holy Cross traditions of learning and service. The school educates students to excel professionally in the dynamic 21st century business environment by emphasizing creative thinking, critical analysis, global collaboration, lifelong learning, adaptation to change and ethical behavior. The school promotes relationships on our campus, with our global partners and across the rich business ecosystem of Austin, focusing on technology, creativity, social enterprise and emerging trends. The model aims to provide the most relevant and impactful student experience and prepare our graduates for the challenges of a connected, digital world. 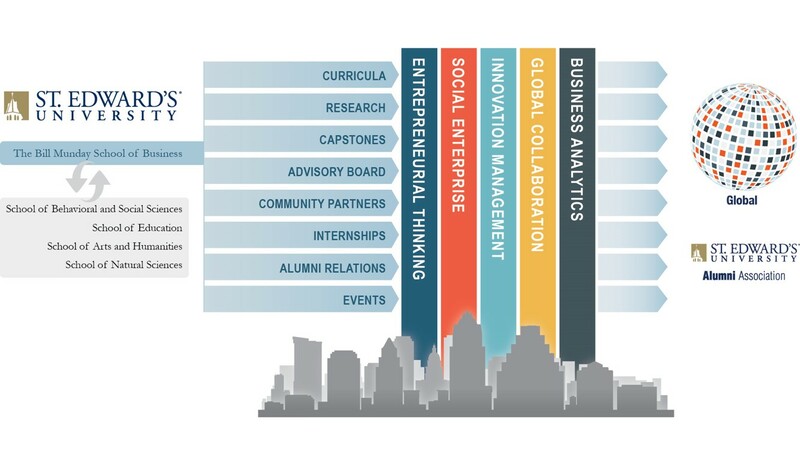 Our business education is built on five pillars, which reflect Austin's business environment: entrepreneurial thinking, social enterprise, innovation management, global collaboration and business analytics. Service is an important component of the St. Edward’s University mission, and at The Bill Munday School of Business, both students and faculty members give their time and talents to the campus and local communities, the region and the state. Service learning is incorporated into the curriculum for Business Communication, a mandatory course for all business majors, and is required for participation in the Business Living Learning Community. Service projects allow students to serve the needs of businesses, non-profits and community members while accomplishing course objectives. Business students honor the university’s Holy Cross heritage by participating in university-sponsored service projects throughout the year. In January, students join Austin community members to volunteer at the MLK Day of Service at Huston-Tillotson University, one of the nation’s historically black universities. In April, students, faculty and staff members help clean and repair homes, churches, parks and schools in the community for the BIG Event. In October, students connect with peers and give back to the city at the Founder’s Day Service Project, a partnership with non-profit organizations throughout the region. Overall, St. Edward’s University students volunteer nearly 80,000 hours of their time through service each year. Our faculty members are actively engaged in local, national and international initiatives. Faculty volunteers at local non-profits, provides pro bono services and offers continuing professional education to non-profit and government entities across Texas. They serve as reviewers for professional journals and conference papers and as officers in professional organizations. The Bill Munday School of Business is proud of a tradition in service and service learning.